Short ribs are tender and delicious and this low carb slow cooker braised short ribs recipe is no exception. Get some facts about short ribs and then grab the recipe below. Sometimes I get overwhelmed thinking about cooking something that seems difficult. Like quiche. Or anything that Julia Child has ever made. Or braised short ribs. They just sound complicated, don’t they? But they also sound delicious. The thing is, they aren’t that complicated, and they are delicious. So, be a little adventurous and give it a try. Please note that this braised short ribs was provided by a a guest chef. The article is written by me, but this mouthwatering recipe was created by a contributor. Sometimes you might have questions about what you are making. Sometimes you need some cooking tip and tricks to make the process easier. Or sometimes you just want to skip right the recipe. There is a button above that will take you down to the recipe without scrolling, otherwise keep reading for some potentially useful information. What type of meat is braised short ribs? 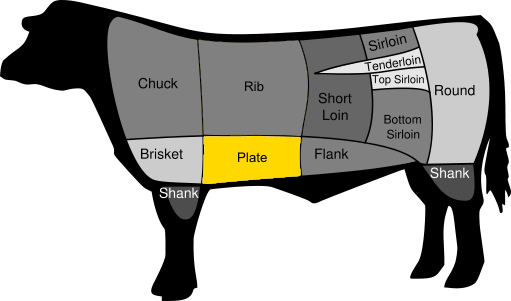 Short ribs come from the lower rib cage of the cow (the short plate) but can also come from the chuck, rib or brisket area. According to Wikipedia, boneless short ribs are cut from the chuck of the cow (which is closer to the shoulder area) from rib meat that is separated from the bone. What red wine goes with braised short ribs? Personally, I think any wine goes with short ribs, but the experts say that Southern French reds, Chilean Cabernet Sauvignon or a Sangiovese from Tuscany make great pairings with short ribs. How do you braise short ribs? What can I substitute for short ribs? If you don’t have short ribs available for a specific recipe, chuck roast is the closest type of meat to substitute. It comes from the same area of the cow and will have the same texture and cook in a similar way. This braised short ribs recipe works great in a Crock Pot but you could also cook it in the oven low and slow as well. Set the oven at 225 degrees F. and cook for 3-4 hours. You could go lower on the temperature as well if your oven allows it. Short ribs are tender and delicious and this low carb slow cooker braised short ribs recipe is no exception. Add salt and pepper to taste to the meat, and sear the boneless short ribs on all sides and then place them into the bottom of a slow cooker. In a mixing bowl, add dijon mustard. Whisk sauce ingredients together until smooth and combined. Place bay leaves and onions over the ribs in the slow cooker. Pour the red wine mixture over the top of the meat, place the lid on the slow cooker. Cook on low heat for 8 hours. You will want to use low heat if possible in order to ensure the most tender ribs possible. Once finished, remove the meat from the slow cooker. Place on a serving platter. Pour the sauce from the slow cooker into a skillet over medium heat. Pour in heavy whipping cream, and whisk the sauce well until combined. Bring the sauce to a boil, and then reduce the heat to medium again. Cook down until the gravy reaches the desired consistency stirring frequently. Serve over mashed or riced cauliflower with gravy and fresh parsley (optional). This recipe would be delicious served by itself, over riced cauliflower or on top of cauliflower mash. What do you do with the onion? Just put it in any time? hi there, step 9 adds the onions! Braising really is the only way to go when cooking short ribs in my book.